« What is Italian Leather? While I typically don’t review OEM straps, I purchased this one afterwards to mount on my Speedmaster Sapphire Sandwich and feel its worth looking at since its nice to be able to compare the quality of OEM straps with aftermarket ones. Since I ended up selling the Sapphire Sandwich on the bracelet that it came with, I no longer have an Omega watch to mount this strap to so have been using it on various other 20mm lug width watches I own. 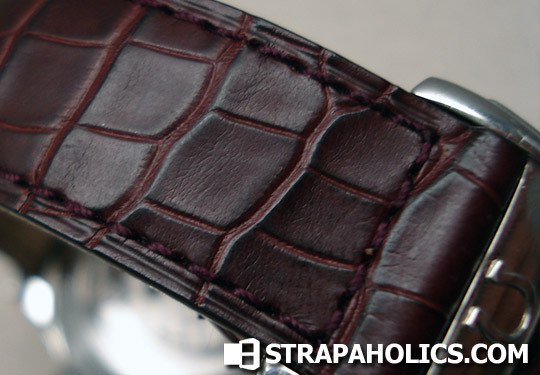 As you can see, this example of the Omega Alligator Strap has a fantastic pattern, with very clean and smooth scales in a rich Burgundy Wine color. The longer un-interrupted look of the single-fold deployant straps makes the watch look so much more elegant in my opinion. I much prefer this configuration over the double butterfly deployants. There’s a close-up of the nice clean alligator scales. I’ve seen a few of Omega’s Matte Alligator straps, like the one that came with the new Aqua Terra 8500, and was not as big a fan of it as I am of these semi-gloss straps. They seem to have just the right amount of gloss to look classy, but not too much that they look patent. 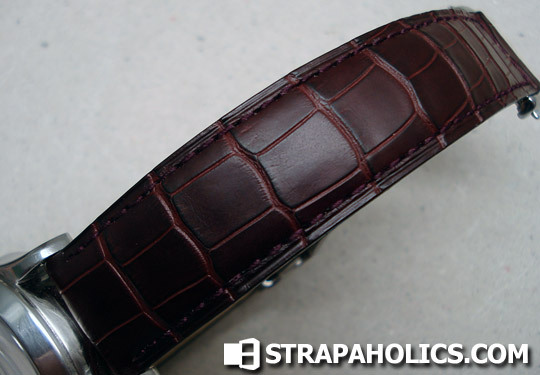 These Alligator scales are just the right size, and the quality of the scales usually makes or breaks a strap. In this case the quality makes the strap. The matching burgundy stitching works great with this strap as well. Without a doubt one of the higher quality OEM straps on the market, which I suppose justifies their high price. 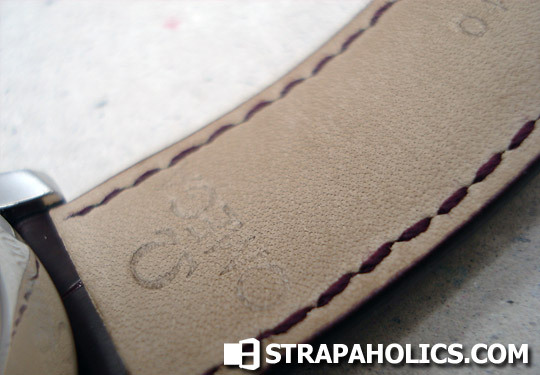 Overall, and outstanding strap from Omega. Their quality of strap matches those from competitors such as Breitling and JLC, and exceeds the quality of many similarly price brands such as Zenith and Ebel. Having said that, most higher quality aftermarket straps of this caliber are available for just a little over $100, which is a much better value than this is from Omega directly, so I personally would only recommend buying one of these if you require it for the deployant or if you can get it cheap like I did. 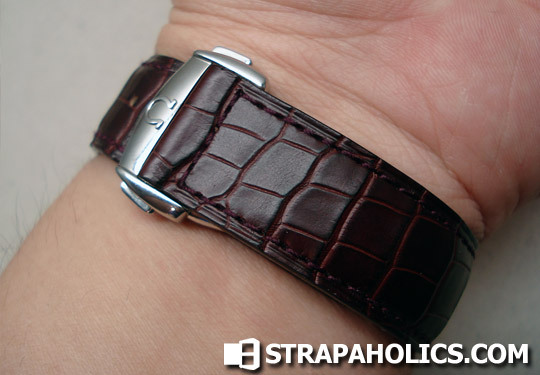 This entry was posted in Watch Strap Reviews and tagged Alligator, Omega. Bookmark the permalink. Post a comment or leave a trackback: Trackback URL. Nice review (sorry, 1 year delay). Could you tell me where ould i find this strap (ottofrei do not have it). I purchased mine from an Omega Dealer… have you tried yours? This strap is beautiful! I went to my omega dealer and he could not locate it. Would you be able to send me the serial number? Any info would help! Hi Ryan, Sorry I don’t have the strap any more as I sold the watch I wore it on. Good luck in your search!! I picked it up on the forums, new, from a fellow watch collector. I see an Omega aqua terra 150 that shows band with at 21.6mm. Is this a size that you can make for that watch? Sorry I don’t make straps, just review and provide a directory for them.